Animation: now has increased ghostliness with cartoon images, and separate Ringer settings for Hand and Tower cartoons. Animation now offers 15 different real ringers c/w Long/Short (close-up) images. and, since v12.30, less reloading when already drawn/loaded, faster loading pics if Flip, and separate Layout settings for Real and Cartoon images. 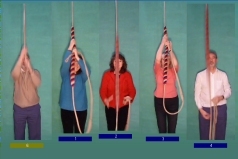 Another option is Show Eyes (face) of the following ringer with cartoon ringers - useful when hunting up dodging. enabled with tower bells (jumps straight to next pull-off position) - a retro-option for practising at the keyboard. The method library now includes Whole Pull Hunt from Singles to Major, Treble Bob Hunt on 4,6,8, Penultimatus and Bayles Doubles (Bastow and Bistow were there already), and Churchyard Bob in Spliced Doubles. Also Plain Hunt is now allowed in Spliced/Mixed Touches, incl. multi-stage, and duplicate rows in the method editor (whole pull hunting).